Green Building Architecture is not only about using expensive products that minimize the use of electrical power which in turn would save oil and contribute to sustainable development. There are various design features that are to be incorporated while designing a green building. After designing the building block in a way which offers a comfortable living space along with reduction of power and usage of energy intensive materials; our next step would be towards outdoor planning which is also as important as the planning of the building itself. The above mentioned green building features are a key towards successful green building design. Earlier in an article on “CII Green Building”, I have discussed various green features that have been incorporated to make the building sustainable and consume less energy resources for its functioning. Passive Features have not really been paid attention to in the design of CII Green Building. All the expensive products have been installed to achieve the same that can be achieved with the incorporation of Passive and Active features with minimal expense. This entry was posted by Benzu JK on September 3, 2010, 5:15 am and is filed under Sustainable Design. You can follow any responses to this entry through RSS 2.0. 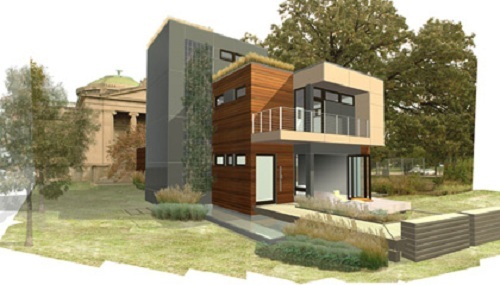 I read your article on ((Passive and Active Features in Green Building Architecture | Sustainable Development)),. most impressed on your vision,.in this ,.I had seen Sustainable Architecture is not a rocket Technology,. and ,.My comment are,.in passive concepts MVHR also plays a key role(becos in passive mostly there wont be cross ventilation)),.and ,.passive is most workable for cold countries,. It would be much detail if you would compare between passive for cold and hit countries,.,. I am Ilrshaad Goolamally from Advance Space Structure Co Ltd in Mauritius. I actually the Project Manager for Green Building Department and we are looking for interested customers in Green building. Thanks to let us know about your contact details and we shall contact you shortly. I read your article and was impressed by your clear ideas about active and passive features of agreen building. But can poor people do all this. Is there any green technology which can help poor people to make ecofriendly dwelling units. I am Irshad Goolamally of Advance Space Structure Co Ltd in Mauritius. We are interested to contact you as one of our department is actually focussing on building Green houses and buildings. Thanks to provide us your contact details. The article was very illuminating.